Craig Gallagher is a PhD candidate in History at Boston College. His dissertation analyzes Scots and their religious and economic networks in the late seventeenth century British Atlantic World. Atlantic history has always had at its heart a simple enough goal: to connect the histories of Europe, Africa, and the Americas so that historians can better understand each in relation to the others. Scholars have disagreed about how best to realize this goal, and about whether it is a goal worth realizing at all, but few have denied that Atlantic history as a pursuit has enriched our understanding of the early modern world. Although this has been particularly true for historians of the British and Spanish empires in the Americas, it is a more recent development among scholars of the French empire. By convening the “Early Modern France and the Americas: Connected Histories” Symposium (Program; #FrenchAtlantic on Twitter) at Boston College on May 2-3 – an event co-sponsored by the Institut des Amériques – the organizers, Owen Stanwood (Boston College) and Bertrand van Ruymbeke (Université de Paris VIII), sought to showcase those historians of France and French North America whose work, either in print or in progress, has extended an Atlantic perspective to the history of France and its early modern empire in the Americas. That the speakers, respondents, and organizers hailed from both sides of the Atlantic also helped to develop an often undervalued yet increasingly important aspect of Atlantic history, namely collaboration between historians who not only work on, but actually live in, disparate parts of the Atlantic World. In their opening remarks, Stanwood and van Ruymbeke emphasized their belief that scholars living in France and the Americas were well suited to compare and contrast the histories of their homes, and that they hoped this collaborative endeavor would lead to further cooperation between the two groups. 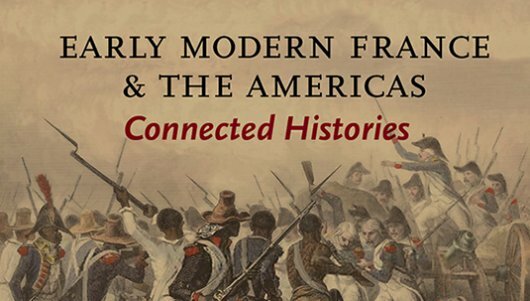 The various panels were organized around four key historical themes – religion, political economy, the Enlightenment, and the Age of Revolutions – that connected France to the Americas in the early modern period. The symposium was opened by David A. Bell of Princeton University, who gave a keynote address on the origins of militarism in Revolutionary France. He distinguished it sharply from the kind of military government that early modern Europeans would have been familiar with from their history lessons about Caesar and the Roman Republic, and from Machiavelli’s ideal of citizen-soldiers. Instead, he argued that the events of the French Revolution gave rise to the modern division between civilian and military spheres that we take for granted today. As an example, he contrasted how George Washington had sidestepped his chance to impose military rule on the early American republic with how Napoleon seized his in the French. Having begun in the late eighteenth century, the conversation then shifted back to the early seventeenth century. The first panelist, Caroline Galland (Université de Paris Nanterre), gave a paper on the Recollects, the first missionary order that traveled to New France with Champlain. She argued that the Recollects’ role in shaping that colony has been obscured by a combination of a fire at the Recollect monastery in the nineteenth century – believed to have destroyed all their records – and a robust Gallican strain in Quebecois nationalism that had suppressed the Recollects because of their links to the absolutist regime of Louis XIV. Following a pointed comment from Leslie Choquette (Assumption College), the discussion shifted from Galland’s efforts to restore the Recollects to their place in the historical record to questions of evidence, such as how one reconstructs historical narratives from unlikely sources, as in this case where Galland had written a history of missionaries using military and legal records. The high standards set by the first discussion were met throughout the day, beginning with the second paper by Chris Hodson (Brigham Young University). Hodson offered a robust critique of the “failure” paradigm, which he argued has dogged scholarship on France’s American empire. His discussion of John Law’s Mississippi Company and its impact on French relations with indigenous peoples in Senegal and colonial Alabama vividly emphasized the reach and influence of that empire. His central contention, that “success” ought to measured not in terms of imperial infrastructure but in how far imperial influence extended into indigenous interiors, moved his respondent, Alexandre Dubé (Washington University) to challenge him on how to measure an empire’s reach if not through political institutions. Through conversation with the audience, a range of alternatives were proposed, such as the circulation of money, backed by a given state, or the ability to project force into a hinterland, following Richard White’s argument in The Middle Ground. The third paper, by Neil Safier (John Carter Brown Library), focused on how eighteenth-century botanists during the Enlightenment tried to standardize the process of collecting, preserving, and classifying the samples collected overseas for their examination. He focused on how they both created and consumed travel literature, updating classic texts such as Garcilaso de la Vega’s Royal Commentaries to correct for errors in his botanical knowledge, in order that other botanists might avoid making similar errors. His respondent, Chris Parsons (Northeastern University), commented that Safier was successfully blending the history of science with environmental history in his work, and commended him for connecting the two. The fourth and final paper, from François Furstenburg (Johns Hopkins University), was a self-declared “think piece” in which he suggested that scholars of the American Revolution need to do more to place the conflict in a global context. He also proposed that historians ought to recognize the economic benefits the American alliance brought France beyond simply allowing them revenge on Britain for the Battles of Quebec and Plassey, not least access to American lumber, which he styled “the oil of the eighteenth century.” Furstenburg’s was perhaps the most controversial paper, offering towards the end an argument that there may indeed have been something unique about American politics in the Federalist period in that the United States did not descend into bloody violence over the Revolution settlement, at least relative to what happened in France. The comment from Marie-Jeanne Rossignol (Université de Paris Diderot) suggested he was fighting a losing battle by attempting to rename the American Revolution, pointing out that the wars of the French Republic before Napoleon still retain the name Revolutionary, but felt he had made an important point about the post-Revolutionary period in America while possibly overplaying the differences between the United States and France in the eighteenth century. As suggested here, the presence of so many innovative, dedicated scholars of France and her American empire meant that, despite the quite broad thematic focus of several of the panels, the discussions between presenters, respondents and the audience were always focused and thoughtful. It strikes this correspondent as remarkable that so many scholars from such a variety of backgrounds, working on a wide variety of topics, can nevertheless have a productive multi-day discussion in which each offers something novel to one another. In that sense, for those present, we might well say the “Early Modern France and the Americas: Connected Histories” Symposium brought us closer to the goal of Atlantic history than we had been before. For a recent edition, see Garcilaso de la Vega, Royal Commentaries of the Incas and General History of Peru: Abridged, ed. Karen Spalding, trans. Harold V. Livermore (Indianapolis: Hackett Publishing Company, 2006). « Grade Inflation or Compression?